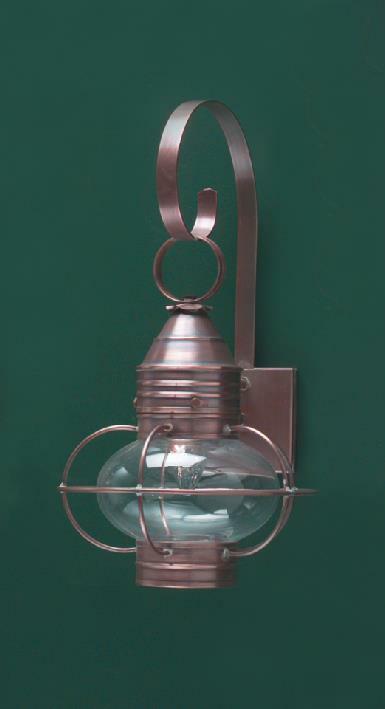 Hammerworks offers a collection of handcrafted Colonial Onion Wall Lights and Colonial Onion Post Lanterns in a range of styles and sizes. 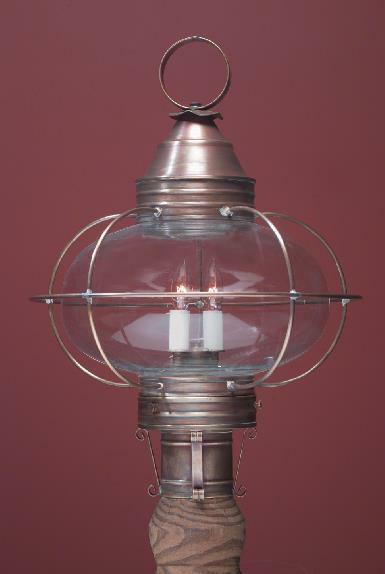 Most importantly, we carefully handcraft each classic style lantern with historical accuracy. Therefore, you can choose from several sizes of primitive wall, post or Hanging Copper Onion Lights for your antique period style home. 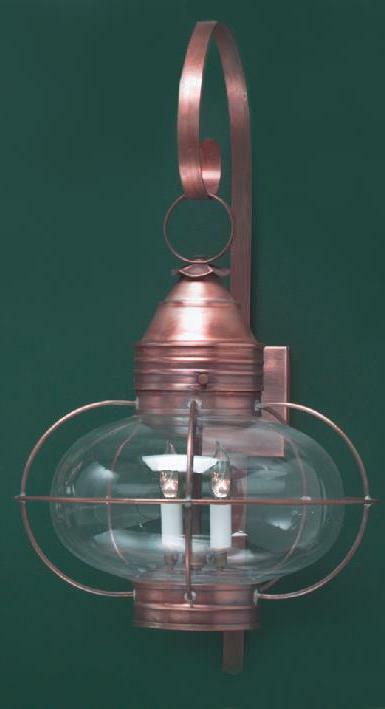 As always, our reproduction onion lanterns are made in your choice of antique copper, brass or custom verdigris Finish Options. In addition, we offer Colonial Onion Wall Lanterns with your choice of standard single bulb or a variety of candelabra style options. Above all, onion lanterns evoke a quintessential nautical design defining old New England Craftsmanship. 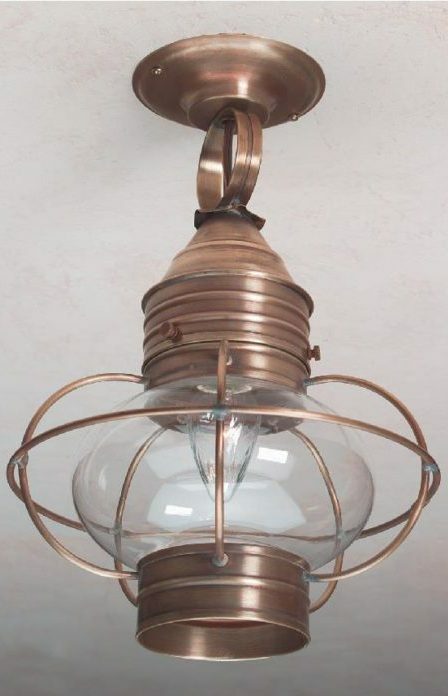 Originally used as work lights on fishing vessels, these solid copper or brass fixtures are suitable for a wide range of home designs. While they are popular for Cape Cod Style Homes, onion lanterns are ideal for Early American Colonial, New England Farmhouse, Traditional Styles and Lakeside Homes among others. 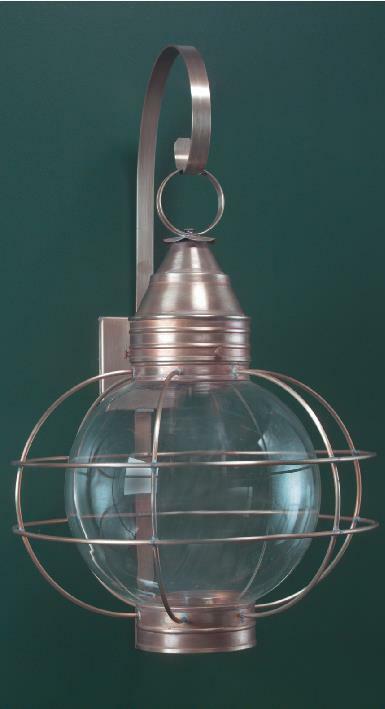 No matter what, Hammerworks reproduction Cape Cod Home Onion Wall Lights are practical and functional for any setting. Furthermore, they coordinate with the similarly designed post and hanging fixtures. Also, our Cape Cod Style Onion Wall Lanterns are made in several sizes, from the petite OL6 to the imposing RG12 model. Thus you will find one just right for any space. Additionally, you can use them in both indoor & outdoor settings. Of course, the obvious placement is on the exterior of your home. However, interior uses range from entrance halls & kitchens to family rooms, bedrooms & bathrooms. Therefore, colonial onion wall lanterns are suitable wherever a light is needed. Not only that, the attractive design blends well with many decorative designs. 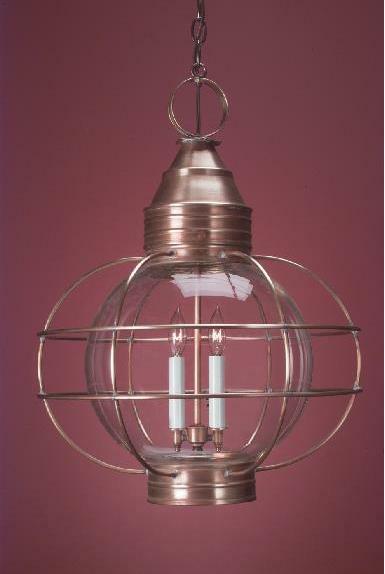 As always, we create New England Style Onion Post Lights completely by hand in your choice of solid copper or brass. Consequently, they withstand harsh weather conditions and will not rust or corrode. Furthermore, these pole lanterns have a standard 3″ post collar. Therefore, you can mount one on the Wooden or Aluminum Lantern Pole of your choice. In addition, we offer onion post lights in three different sizes (Models OL10, OL12 and RG12 ). Thus, you can choose from with either a Round or Onion shaped glass globe. Finally, our Early American Onion Post Lights coordinate perfectly with Cape Cod wall and Hanging Onion Lantern fixture styles. Especially relevant, we create a selection of Hanging Colonial Onion Lights to complement the post and wall lanterns. Therefore, with a variety of sizes are available you can easily complete your lighting design. Also,choose from the same solid copper, brass or custom verdigris finish. Most importantly, each rustic hanging onion light fixture is equipped with a matching ceiling canopy and 2 feet of chain. Just as with our Colonial Wooden Chandeliers additional chain is available for a minimal charge. In addition, we make hanging onion lights with your choice of a standard single down light or a variety of candelabra options. 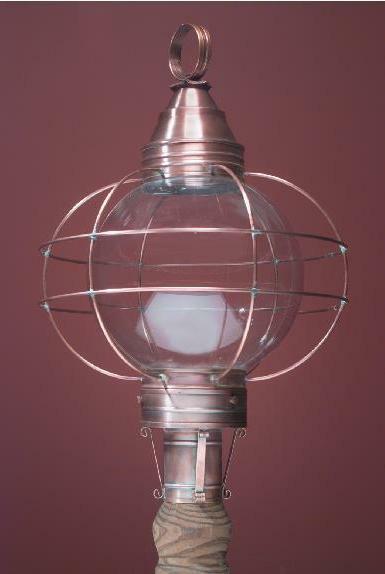 Furthermore, we supply all reproduction onion and round globe lights with sturdy clear glass for excellent illumination. 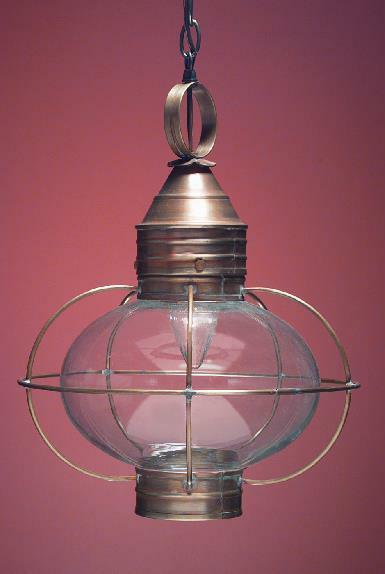 Early American hanging onion lanterns are primarily intended as outdoor lighting. However, you can use them in many interior places around your home. From Foyers to Kitchen Island Lighting and beyond, the classic style of our Colonial Home Hanging Onion Lights lends itself to a multitude of uses. 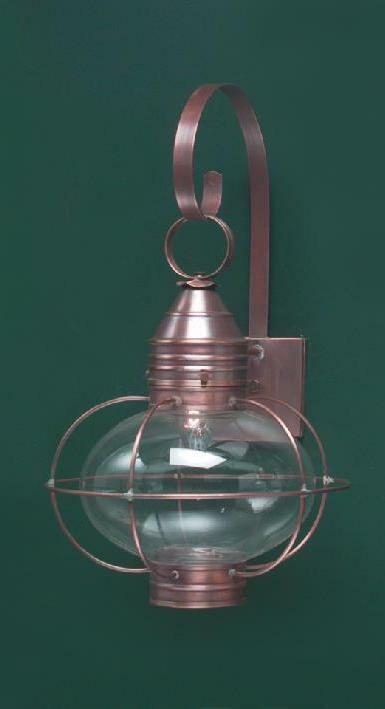 In addition to onion lights, we offer a wide variety of Colonial Home Outdoor Lanterns. Of course, each rustic style outdoor light fixture is made completely by hand in the USA. In addition, any of these primitive outdoor lights coordinate nicely to “mix and match” with the onion styles. For example, pair the Cape Cod Colonial Wall Lights or the Copper Colonial Wall Light W101 with POL12 Onion Post for simple classic effect. 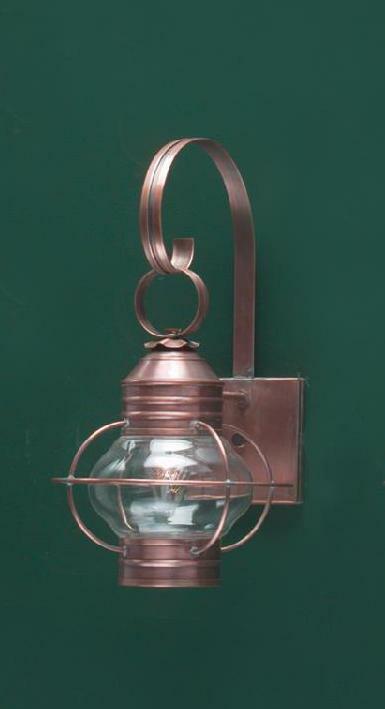 Our exterior lighting models include Early American post mounts, wall and hanging light fixtures. Above all, our collection of Traditional Home Lanterns complement a wide variety of architectural home designs. Most of all, this historic style lighting collection offers a classic look sure to please. The simple lines of Colonial New England Style Copper Post Lantern P101, or wall lantern “Sturbridge” WM102 are refined and graceful. Thus, from a time-honored Colonial Williamsburg, Cape Cod Cottage or New England Style Farmhouse, our Traditional Home Lanterns are ideal. In conclusion, at Hammerworks you’ll find we an wide-ranging collection of Lantern Style Choices. Thus, you’re sure to find handcrafted light fixtures to complement your home. From a simple Early American Salt Box, Traditional Colonial, Log Home or Cape Cod Cottage, we offer the right lighting. In addition to the Colonial Onion Light Collection, our designs include Tudor, Traditional, Primitive, and Arts & Crafts. Not only that, the majority of our rustic wall lanterns complement matching post & hanging styles. Consequently, Hammerworks is the primary source for outdoor lights, adding a finishing touch to the architectural style of your home.